Traditional software development methods struggle to keep pace with the accelerated pace and rapid change of Internet-era development. Several "agile methodologies" have been developed in response -- and these approaches to software development are showing exceptional promise. 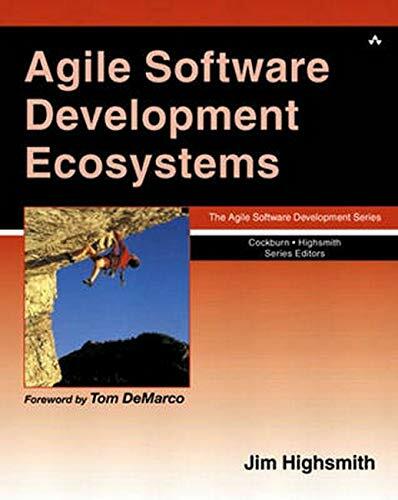 In this book, Jim Highsmith covers them all -- showing what they have in common, where they differ, and how to choose and customize the best agile approach for your needs. Highsmith begins by introducing the values and principles shared by virtually all agile software development methods. He presents detailed case studies from organizations that have used them, as well as interviews with each method's principal authors or leading practitioners. Next, he takes a closer look at the key features and techniques associated with each major Agile approach: Extreme Programming (XP), Crystal Methods, Scrum, Dynamic Systems Development Method (DSDM), Lean Development, Adaptive Software Development (ASD), and Feature-Driven Development (FDD). In Part III, Highsmith offers practical advice on customizing the optimal agile discipline for your own organization. For all software developers, project managers, and other IT professionals seeking more flexible, effective approaches to developing software.